The Penny Grey and Oak Side Table is a great way to make use of unused and unloved space in your home. 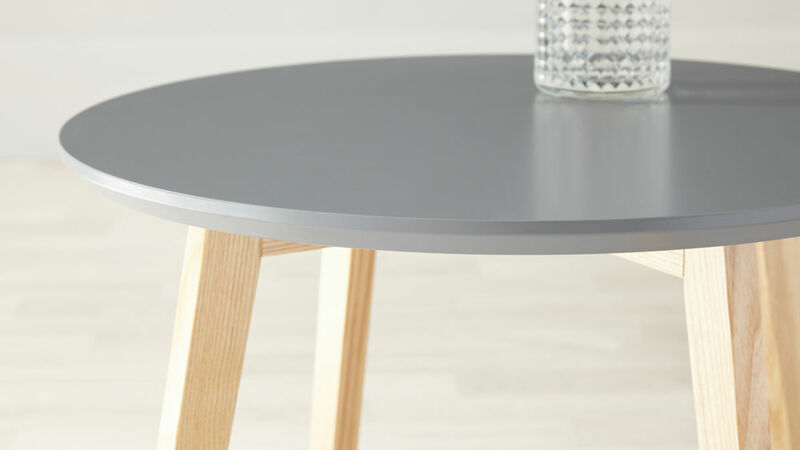 Because of its round table top and streamlined design, the Penny Side Table can easily fit into a range of spaces to provide you with a handy extra surface for styling and storage. What's more, the grey table top will add a hint of colour to your space but still keep the scheme looking sleek and sophisticated. This Side Table measures 36cm in height and 50cm in diameter. This practical sizing allows you to place the side table in spaces that are perhaps too small for something like a coffee table, allowing you to really make the most of the space you have available, a great little perch for your cup of tea!. This compact side table is also lightweight and easy to move around your space, so it's easy to move about to the exact spot that you need it. The finish of the Penny table is a matt satin. It has a light sheen rather than being highly reflective, making it a great alternative to high gloss. As grey is such a neutral colour, it's an easy way to introduce interest to your space without it looking too strong or overwhelming. The table top of the Penny has a chamfered edge which helps to create its sleek and streamlined, slightly scaninavian appearance. This subtle detailing gives the table a much softer look while also making it that bit safer around younger children. 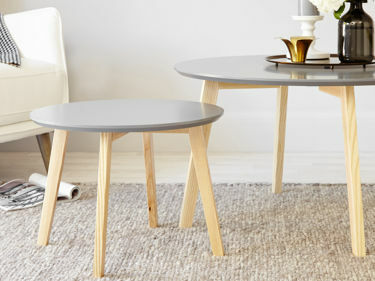 The four legs of this Scandi style side table are made from solid oak. They are set at a slight angle which helps to really open up the space around the base of the table. It also adds a touch of interest to the shape of the legs, rather than having them just poke out from the table top. 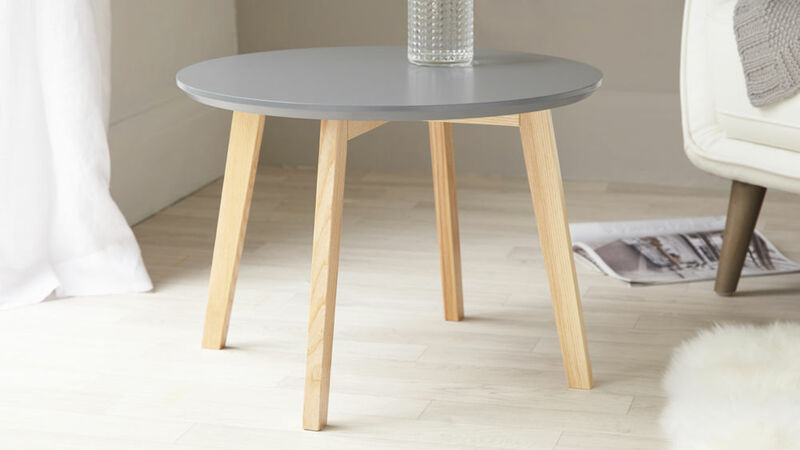 The Penny Grey and Oak Side Table comes complete with floor protectors meaning this table would work just as well on a hard or laminate floor as it would on a rug or carpet. The Penny Side Table is a stand alone piece but you could always style it along with one of our Penny Coffee Tables to create a larger surface for styling a storage. The great thing about this is that you can always move the tables apart when you need them elsewhere. The Penny Grey and Oak Side Table not only looks great but is incredibly practical too. Whether you use it by your seating area, in your bedroom or even as an extra surface in your home study, this modern side table will become a subtle yet invaluable asset to your home styling! 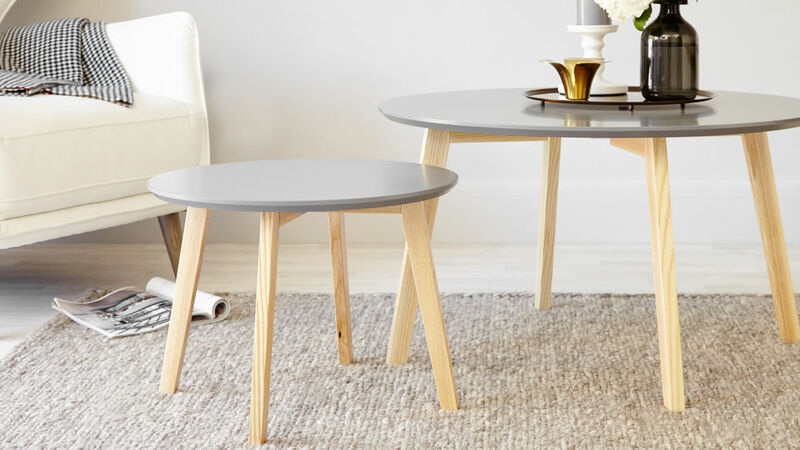 One of the great things about the shape and size of the Penny Side Table is that it can be styled alongside our range of Penny Coffee Tables. The tables work really well together as they create a larger styling and storing surface in your space, with the added benefit of being able to move the side table and coffee table apart when needed. The side table is slightly lower than the coffee table which allows you to play with height when it comes to styling. Combining the Penny Side Table and Penny Coffee Table is also a great opportunity to mix up the colours in your space, with the oak legs tying the whole look together.